It is our policy at Jade Bloom to ensure that every purchase, whether made by a first time customer or placed by a seasoned member, is completely risk-free. We want every customer to absolutely love their purchases. We are fully committed to you and your order happiness and with Jade Bloom, you really can try any of our products risk-free. If you are unhappy, for any reason, with any product you purchase from us, simply contact our support team with your order number and we'll issue you an RMA and a prepaid return label; that's right, we pay your return shipping costs :). Any products may be returned for any reason within 120 days of initial purchase. Can our competitors say that? Our mission first is to manufacture the highest quality natural products and 100% pure essential oils, and then secondly to price them as low as we possibly can. We understand from our market research that all of our products could be priced much higher and that higher prices would actually lead a certain segment of the market to purchase higher quantities at a larger margin. Maximizing profits is the mantra of the economist and the investor, but that mantra takes a back seat at Jade Bloom that is privately owned. Profit maximization conflicts with both our mission statement and the reason Jade Bloom exists. We are committed to bringing the benefits of all-natural products and essential oils to as many people as possible around the world and not to just those that can afford them. The reason we exist governs every managerial and investment decision at Jade Bloom, "to change the way people think about health." "This is too good to be true." We love this sentence that is sometimes directed to us as a statement and other times intended as an inquiry. This statement is a sign that someone has taken the time to somewhat explore what Jade Bloom has to offer and they don't understand how our pricing and promotional model is possible without sacrificing on the quality of our products. The point an individual usually arrives at this statement often follows this thought pattern and observations: 1) they see low prices on hundreds of products, 2) they discover that Jade Bloom gives free shipping on all orders over $10, 3) then they learn that all orders earn up to 6% back in loyalty points, 4) they see many coupons, sales, discounts, and even freebies, and 5) they might even dig far enough to discover that Jade Bloom will give away $32 in free products for those that take the time to learn about how Jade Bloom produces the highest quality essential oils in the world and how to use them to improve their health. Unfortunately, we know that some people stop their research into Jade Bloom at this point drawing the erroneous conclusion that this is just too good to be true. However, most people continue to dive deeper into our story and discover some intriguing facts that obliterate the "too good to be true" fallacy. Here are just a few: 1) Jade Bloom only sources wildcrafted raw plants and seeds from the best indigenous locations around the world with the richest soils and ideal climates for that plant, 2) all raw materials are organic, pesticide-free, and non-GMO, 3) Jade Bloom visits and audits our farmers on a regular basis, 4) optimal harvesting times and seasons are observed as well as optimal distilling temperatures and times for our essential oils, 5) every batch of oil is GC/MS tested by a 3rd party along with many other tests to confirm purity that include: Organoleptic, Specific Gravity, Optical Rotation, Refractive Index, Contamination, and Stability. Many companies claim to perform these similar tests but expect their customers to just take their word for it. Jade Bloom makes a point to publish the results from these tests to each product page on our website under the "Certifications" tab. We sincerely appreciate the trust our customers demonstrate to our company, but we don't want them to just take our word for it. We work hard to educate consumers about the importance of these tests and how to review and read these reports as there have been many "fake" oil brands and adulterated batches of oil being sold to the unsuspecting public. These synthetic oils can be harmful and will not provide the same level of efficacy as a true 100% pure essential oil. We recommend you do some due diligence on the brand of oil you choose to use regularly as a Google search will reveal validated GC/MS tests for most well-known brands that will provide evidence of "fake" oils or confirm the purity of oils you can trust. Just as there are many "fake" oils on the market, there are also many 100% pure oils. The close cousin of "this is too good to be true" is "you get what you pay for." While it is true that you get what you pay for it can also be true that you overpay for what you get. Many lifetime customers of Jade Bloom began purchasing essential oils from a multi-level marketing company with 50% to 75% markups over Jade Bloom priced products. Before we determined our marketing model, office location, technology expenses, executive salaries, and employee benefits, we determined our mission would be to sell the highest quality products and the lowest possible prices. With this in mind, we allowed our mission to dictate other decisions as far as quality of products, customer experience, and customer service would never be sacrificed. This has required us to make some tough choices over the years, but we believe we have been true to our mission at many crossroads. We do not market our products through a Multi-Level Marketing (MLM) sales model and instead, we have trusted that the quality of our oils and our products would speak for themselves. This decision has been applauded and rewarded time and again through our customers' behavior as they provide a tsunami of authentic and uncompensated referrals, recommendations, social media shares, and product reviews. We have also been able to pass along product savings by lowering marginal and fixed costs in product sourcing by cutting out the middleman, maintaining low overhead, hiring and promoting internally through an amazing culture where every Jade Bloom employee loves what they do and who they serve, and bringing together an executive team that is passionate about the lean product startup mentality and minimum viable product development. How is shopping with Jade Bloom risk-free? Jade Bloom has sold more than 1 million bottles and every bottle has been backed by our risk-free policy. We are so confident in the quality of the products we manufacture that from day one, our policy has always been to provide a 100% refund on any product for any reason. We want you to be satisfied and we want you to be able to try something new that you might not normally try. The majority of our customers have discovered their favorite regular products because of this policy. It gets better :). True risk-free shopping means that you should be able to try anything and if you are not fully satisfied then you should be made completely whole. That means you have the same amount of money in your bank account after you return a product you decide you don't like or that breaks in the mail or that you ordered by accident or that you came up short on money that month and just need the money back instead or whatever the reason. We may ask you the reason to improve our service and products, but your answer has zero consideration on whether you get your money back. Since most of our products are shipped through the mail to our customers, that means there is a cost of shipping the product to you and a cost to return the unwanted product to us. Our risk-free policy says you don't pay shipping costs in either direction on returned products. 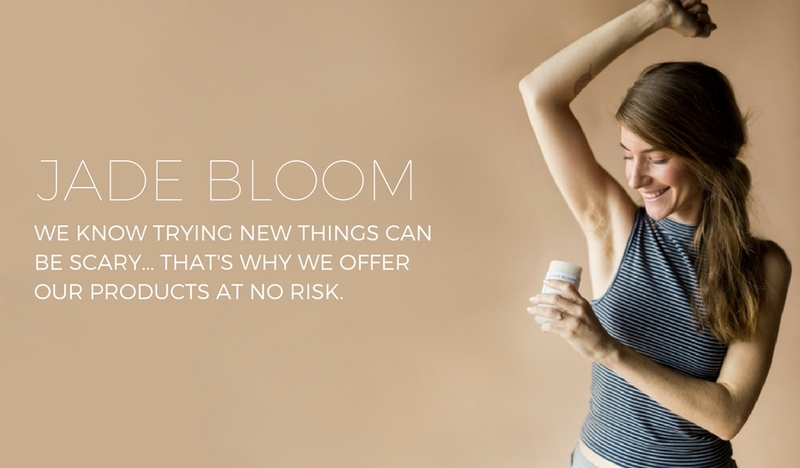 So if you are new to Jade Bloom we sincerely hope you will allow the quality of our products to speak for themselves and lean on our risk-free policy. Do a Google search and read reviews from other customers. Poke through the verified official reviews from customers like you on products you think you might like. Scour our Facebook page to discover thousands of discussions and positive reviews on Jade Bloom. If you are a seasoned buyer we want to say thank you for making Jade Bloom great and for joining us in our cause to change the way people think about health. Take advantage of our risk-free policy and try something new you have been wondering about.